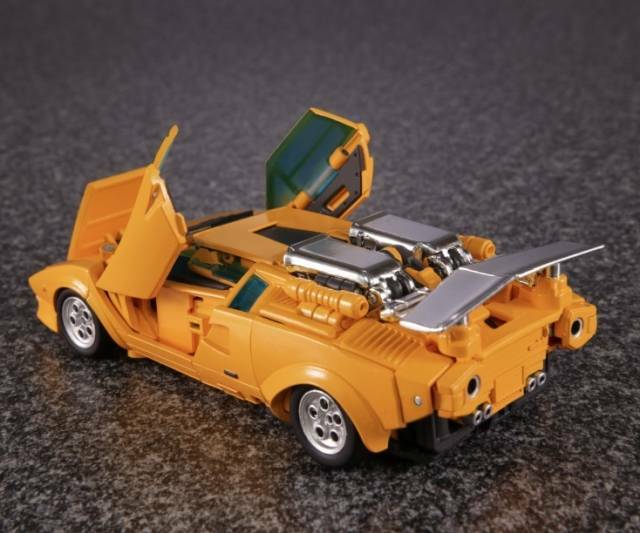 MP-39 Sunstreaker is officially licensed by Lamborghini and is a super charged Countach LP500S featuring a huge air intake! In vehicle mode features retractable headlights, and the air intake is chrome plated. In robot mode includes flare gun and laser gun. Includes bonus alien face from the episode "Hoist Goes to Hollywood." 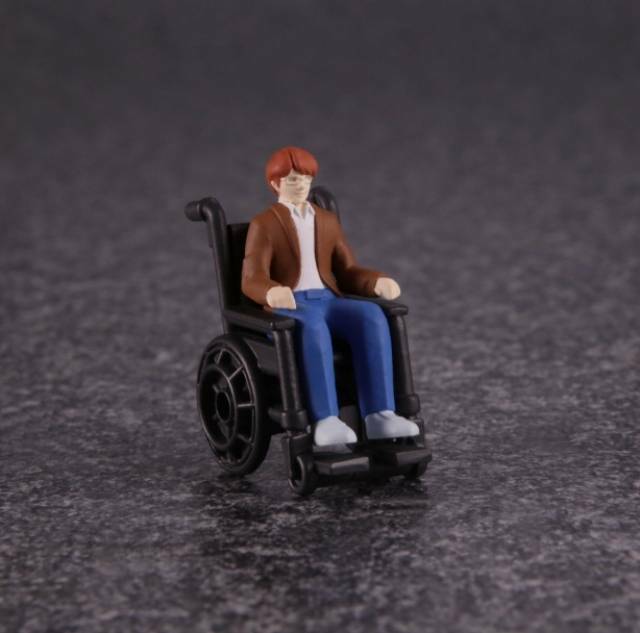 Also includes Chip Chase in wheelchair mini figure. 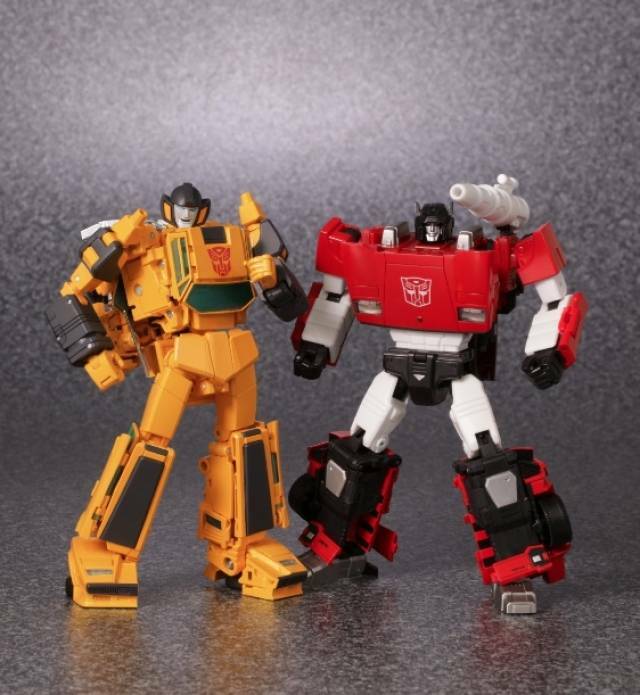 Sunstreaker finally joins his brother Sideswipe, in the Masterpiece ranks! 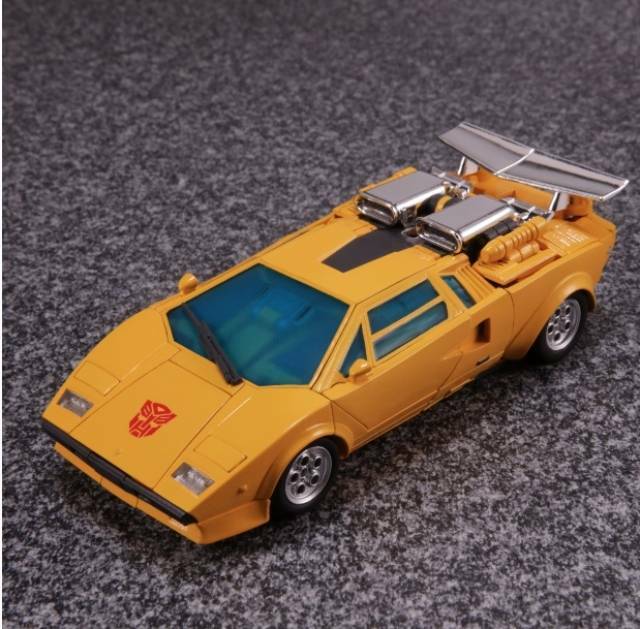 Masterpiece Sunstreaker is officially licensed by Lamborghini, featuring his iconic yellow color scheme from his G1 days! "The Sunstreaker we've been waiting for!" After years of waiting finally we have an original Sunstreaker the best one out of the three that have come out, Sunsurge comes in second place and still is worth keeping if you don't already have him. When Sunstreaker is in robot mode he reminds me of the G1 cartoon of the 80' s, to me he's the best Masterpiece so far of the line, the only minor gripe I have are his hands they are painted and will chip in time I wish that they could have just used plastic instead of painting the hands-- also the tires I wish that they were rubber but I guess its best if they stay plastic. Sunstreakers car mode even though he looks a lot like his brother Sideswipe I wish it looked the way it did in the cartoon just to show of the differences of the Lamborghini Countache models. I recommend this purchase to all who are fans of the show or the toys you will not regret it. Amazing figure, great level of detail for the Alt Mode, very toon accurate but still updated version of the character, it is almost perfect! If it only had led headlights and radio controlled, that is too much to ask. If you get this one, you won't be dissappointed. Absolutely fantastic figure which ticks ALL the boxes you could ever want from a true to generation 1 comic/cartoon Sunstreaker. Whoever designed this is a genius. 10/10 from me. one of the more entertaining transformations we've had in a while. This figure is amazing! Very posable in robot form, bends even at the waist on a nice pivot. In car form he is smooth and clean looking, and has a few looks to play with. The laser canon on the rear where his fin is just like the G1 cartoon. Paintjob is grear to, a must have for avid G1 lovers and collectors. "MP-39 - Sunstreaker, He is amazing! " His transformation is a bit tricky at first. Be careful with the doors, my passenger side driver door lost its hold in the lambo door open pose after a few transformations. Okay, so yeah.... he is awesome. I mean, he looks freaking alive. I have him posed next to my MP-36 Megatron (and MP-21G bumble) and it looks AMAZING! Articulation is on point with him, I'm just blown away at the level of detail put into this dude. Seriously, I love all three modes so much (counting the 2 car transformations) that I want to buy 2 more MP39s so I can have all three modes displayed together. The 2 car modes are freaking awesome. This is a nice entry point monetarily for an amazing MP. Again, the transformation is challenging (Go Slow), but your purchase will feel so good in all the modes. And perfect box from TFSource by the way. I have it displayed as well. 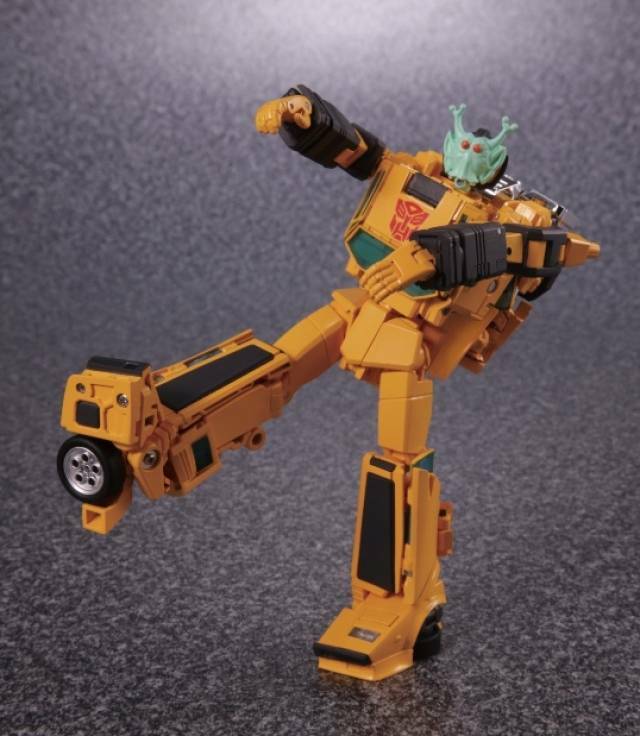 "Looks great, very poseable, a little fiddly"
Sunstreaker is a nice addition to the Masterpiece collection. He definitely looks more cartoony than most of the other MP cars, but the difference isn't too noticeable on the shelf. Very poseable and full of character. 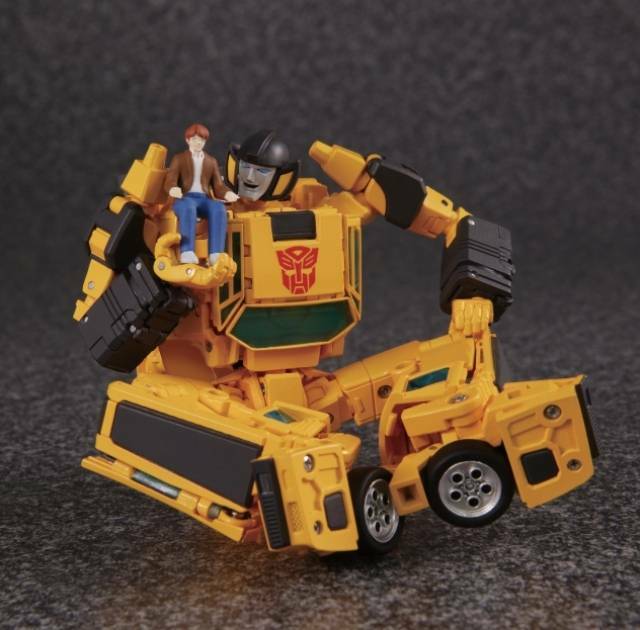 Transformation is scary at parts; the car doors are on TINY joints, and the backpack scrapes against itself. I can't get the car to fully tab together, but I get close enough. Sunstreaker is delicately not my favorite, but a good addition to the collection. 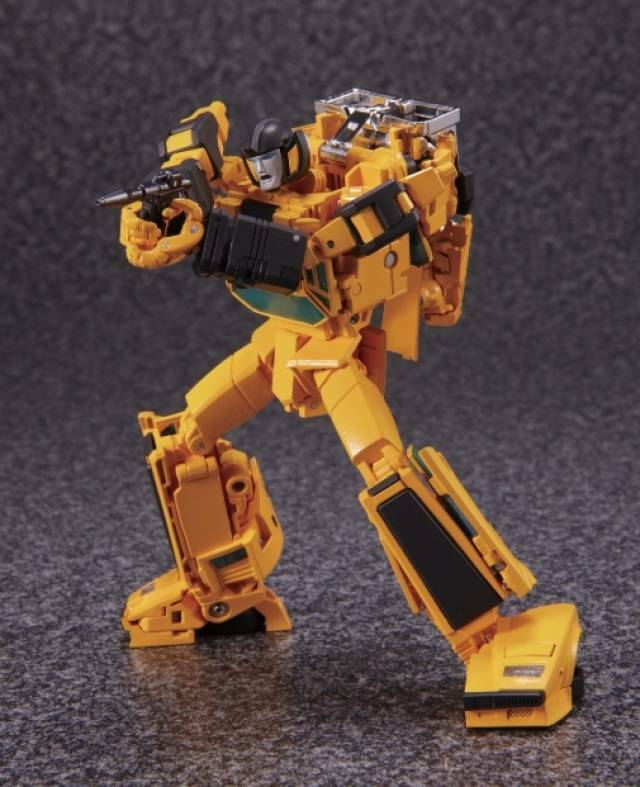 I'm not even a sunstreaker fan, but this figure is one of the best MP's takara has ever put out. Looks great, fun transformation, and can pull off the best poses thanks to some wonderful articulation. A must have for any collectors shelf.